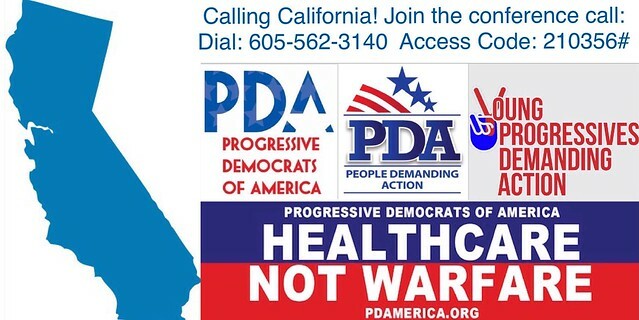 Progressive Democrats of America (PDA) is working with our allies and inviting our endorsed candidates to weekly calls every Monday Night starting tonight. Join PDA-Endorsed Candidates and Guests for discussion/information about the Races and the Ballot Measures! Save these Dates: 7pm TONIGHT Monday, October 10, and then October 17, 24, 31, and November 7 (or Sunday November 6). We hope you can join us! Watch your email box for updates! On a computer, use any browser, just click on the link. Nothing to download. Please support PDA now! Support our efforts with a generous donation now. Money short? Then contact Mike "Phone Guy" Fox to sign up to make important movement mobilizing phone calls or contact PDA Field Coordinator Judy Hess to get help organizing in your area.